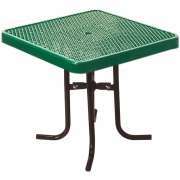 Where can you find durable picnic tables? 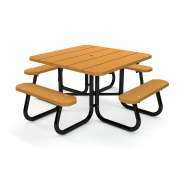 Hertz Furniture&apos;s outdoor picnic tables are sturdy and colorful. They will make a great addition to any area by giving children and adults a place to sit and eat while enjoying fresh air. When the weather is pleasant, everyone will enjoy learning, eating, and playing by some round picnic tables. 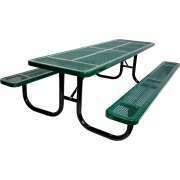 Choose Ultra Play Picnic Tables so you don&apos;t have to worry about high cleaning and maintenance costs. 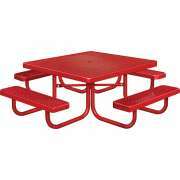 Ultra Play tables are designed for safety and come in bright colors that will encourage everyone to sit outside. With such a comfortable and attractive place to sit, students will love getting fresh air during lunch time. 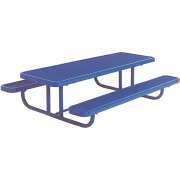 What makes your picnic benches so durable? Any equipment that is left outside permanently needs to be fortified against all potential weather conditions. 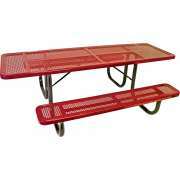 Hertz Furniture is proud to bring you Ultra Play picnic benches that are constructed from steel covered with thermoplastic. These tough materials are built to withstand the elements, and even graffiti can be wiped away easily. 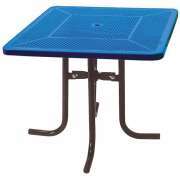 Tough tables ensure that students can enjoy many years of pleasant outdoor seating. Now you can be environmentally conscious while enjoying a great outdoor eating area. Steel tables aren&apos;t the only kind that are designed to last outside. 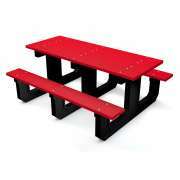 Resin picnic tables from Jayhawk are made from recycled plastic with heavy-duty hardware. They will not rust or fade over time, so you can enjoy their natural coloring for many years to come. The wood-style slats offer the appeal of a wooden picnic table with the durability of resin. 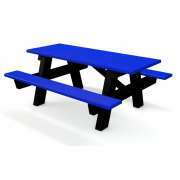 What options do you have for picnic table design? Although our outdoor tables are built to last, they also have quite an inviting appearance. They are available in a selection of vibrant colors which can be coordinated with playground equipment or school colors. They also offer a wonderful way to brighten up an outdoor area and encourage students to enjoy fresh air. A choice of diamond cut or perforated patterns on the surfaces of metal picnic tables creates an additional element of style. 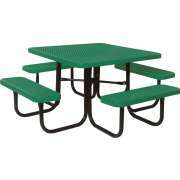 What shape picnic tables are available? 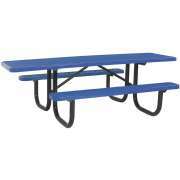 Picnic tables come in various shapes so they can fit in many areas and facilitate a number of different arrangements. 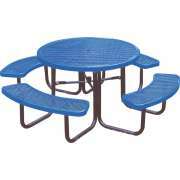 Round picnic tables create a friendly atmosphere where everyone can participate in the conversation while having an easy view of their friends. We also have rectangular and square tables for those who prefer classic shapes. 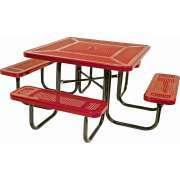 Should I get picnic tables for my preschool? 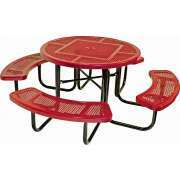 Having picnic benches in a preschool or daycare can add a lot of fun to the school day. Caregivers can take the whole class outside for lunch or snack, or even host some lessons about nature at this convenient venue. Preschool picnic tables are also great for all of those messy projects in your early-childhood classroom that involve eco-friendly materials. When there are many students in one class, it is hard to make sure that everyone can do what they want at the same time. Things can get particularly complicated in a preschool at meal times when some children finish their lunches before others and are ready to go and play. When outdoor picnic tables are placed right next to a play area, caregivers can keep a careful eye on little ones who are eating lunch and playing on the playground at the same time. Outdoor tables are available both with and without attached seating. Built-in seating saves the time and effort of finding appropriately-sized outdoor chairs or dragging seats in and out of a building every time you want to eat outside. However, if you are in a setting where professionals and older adults might prefer seats with backs and armrests, plain outdoor tables are available as well. 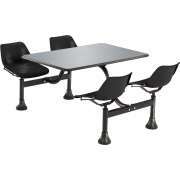 With some enticing outdoor tables, lunch time can become lots of fun. 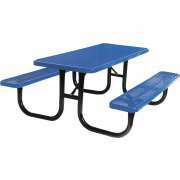 Our picnic tables are built to last for many years while providing a great place for students to eat lunch. To learn about various mounting and arrangement options, contact the experts on the Hertz Project Solutions team for free project-planning advice.